If you have one single customer, or perhaps just a handful of customers, it can cause you problems with your invoice finance facility. Some factoring companies like to restrict funding in respect of prime debtors (the biggest customer balances on your sales ledger). This can lead to all sorts of cash flow problems for the client. We have helped with many situations where a prime debtor restriction has been imposed and it has led to a client coming to us for help to find an alternative lender that will take a more flexible view. The positive news is that some facilities are tailored to deal with prime debtors or even single debtors. 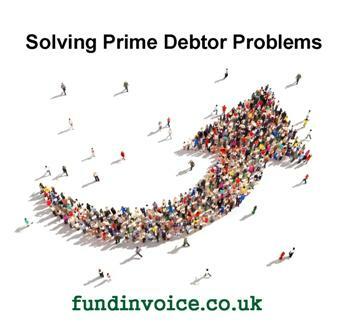 So often its a case of finding the right provider that can help with invoice finance prime debtor problems. Invoice financiers like a spread of debtors on their client's sales ledger. This puts them in a safer position should they ever need to collect out the ledger to recover the money that they have advanced. If there is just one customer, that customer might go bust or experience a dispute that leads to non payment. In such situations it is "game over" for the financier, they won't be able to recover their money. If there are several customers on a sales ledger that risk is mitigated. If one customer fails, there are others that will may still pay and enable the finance company to recover its advance. There are also potential problems for your business when you are dealing with a single customer, or a handful of customers. If you are reliant on one or two customers, a late payment due to holidays, cash flow problems or a dispute could be catastrophic for your company. Using invoice finance will mitigate that risk, and including bad debt protection will almost eradicate it, but you can never completely protect yourself against a dispute over the product or service provided. Yes you can take some precautions such as getting proofs of delivery signed, or satisfaction notes signed for the delivery of services, but the possiblity of a dispute is always there and could require costly and time consuming legal action to resolve. If the customer goes bust you could lose your ability to collect in any of your outstanding invoices, and to bill for the work that's currently in progress. Again you could seek bad debt protection to try and mitigate this issue. However, there is always the possibility that they customer might decide to change suppliers, a risk which you are unlikely to be able to protect against, expect by diluting you reliance on them as a prime debtor. If you only have a few customers, your business might not achieve its full potential in terms of growth. There is a lot you can do to market your own business, but you may want to consider some expert support from a marketing agency. When you only have one or two customers you never feel that you are in a secure position. If any of the issues above occur it can spell the end of your business. Security comes from having a spread of customers. The key to managing large debtor concentrations is to try and avoid them becoming problems. The best way is to seek further customers. You may have tried this yourself without success, so perhaps you should consider using the services of a professional marketing company to help you to grow. Otherwise, any of the problems mentioned above could affect your business. Use an invoice finance company that doesn't penalise single debtors or small numbers of customers. Try to spread your risk by seeking new customers. If you can't find new customers yourself, consult with a marketing agency. Take precautions to protect your business against customer failure, such as bad debt protection. Minimise the possibility of disputes by seeking signed satisfactory proof of delivery or satisfaction notes for services provided.